This guide is intended to show you how to use the XML editor within FATCA Builder. By following this guide you should be able to use FATCA Builder to explore the most important parts of the FATCA XML Schema. However, it is not a full guide to FATCA XML itself. The meaning of the FATCA elements is explained in the IRS's FATCA XML User Guide page and the Igor XML Reporting Guide. Create a shortcut to https://fatcabuilder.digimap.gg/ on your desktop to have FATCA Builder available to you when you need it. You can also click the home () icon at the top left of this page to return to the XML building screen. The data in an XML document is enclosed by opening and closing 'tags'. The tags tell you what the data means, and the data itself goes between the tags. For example in the XML above, the 'TransmittingCountry' has the value GG (meaning Guernsey). Mandatory elements will have initially say '[click to set]'. You can click on this text to enter the data requested. Some opening tags are highlighted in yellow with a small drop-arrow next to them. You can click on these tags to add more sections to your XML. In order to delete an added section, click on the opening tag of the added section. This will open a menu where you will be able to remove it again. Tags may be nested which gives the XML a tree structure. Clicking the small + and - icons expands or collapses branches of the tree. In the example above, the DocSpec element is collapsed (these elements are always collapsed initially as they do not contain reportable information). You only see the opening and closing tags, and not the tags inside. You can expand this element to see the full contents by clicking the +. The red 'i' icons represent validations errors. Click on them to see the error message itself. Sometimes there may be nothing between the opening and closing tags. You can still type text between these tags by first clicking on the gap between them. 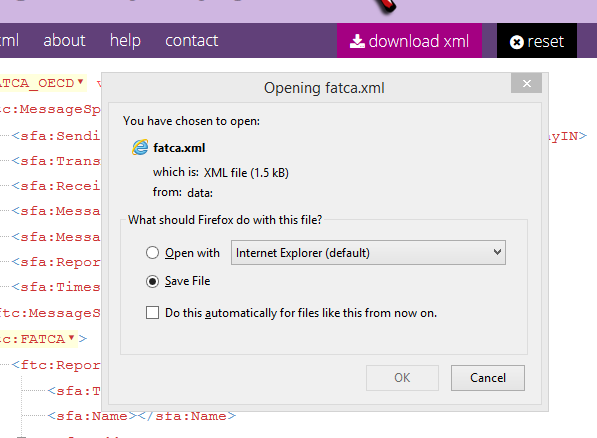 Click the 'download xml' button to download the XML you have generated as a file. This feature unfortunately does not work in Internet Explorer, but works in Chrome and Firefox. As an alternative, you can view the raw XML for cutting and pasting by clicking the 'raw xml' link. If you have downloaded an XML document from FATCA Builder to your PC, you can import it back in by dropping it onto the XML editor. FATCA Builder will remember your XML while you keep your browser tab open. You can open a second browser tab and work on two XML documents simultaneously. If you want to clear all your changes and start again, click the 'reset' button.